Over the last 200 years, more than half of the planet’s forest cover has been cleared to meet the needs of a growing population. Today, 30% of global forest cover has been completely removed and a further 20% has been degraded. The Global Partnership on Forest and Landscape Restoration (GPFLR) estimates that there are more than 2 billion hectares of deforested and degraded landscapes worldwide – an area the size of South Africa, directly affecting 1.6 billion people. In order to increase policy makers, practitioners and land owners to engage in forest landscape restoration (FLR), the German government and IUCN - International Union for Conservation of Nature launched the Bonn Challenge in 2011. The Bonn Challenge aims to restore ecological integrity as well as improve human well-being through multi-functional landscapes. Its aim is to restore 150 million hectares of the world’s deforested and degraded lands by 2020 and 350 million hectares by 2030. Restoring 150 million hectares could capture about one-sixth of the carbon necessary to close the emissions gap. Furthermore, reaching 350 million hectares by 2030 would result in an estimated 0.6-1.7 Gt CO2e (gigatons of carbon equivalent) absorbed per year, totalling 11.8-33.5 Gt CO2e between 2011 and 2030. Currently, 27 governments, enterprises and alliances have made pledges to the Bonn Challenge, bringing the current total to more than 86 million hectares. One country that has fully committed to the Bonn Challenge is Rwanda. It will undertake a border-to-border restoration, regaining 2 million hectares of forests and landscapes within the next 25 years. This amounts to a quarter of its land, an area that only recently began to re-grow after being almost completely lost following years of civil conflict and economic instability. Despite these impressive initial commitments there are still significant barriers to implementing FLR successfully. In many countries, there is a lack of crucial biophysical and socioeconomic data for landscape planning and evaluation. In other countries, enabling conditions for restoration, such as supportive national policies, have yet to be put in place. IUCN offers a means to operationalize promises of restoration through the Restoration Opportunities Assessment Methodology (ROAM). Developed by IUCN and the World Resources Institute, ROAM is an approach to rapidly identify and analyze FLR potential and locate specific areas of restoration opportunity at a national and sub-national level, helping countries build appropriate restoration programs and landscape-level strategies. In this way, ROAM supports nations in fulfilling the Paris Agreement and other international commitments such as the Aichi Biodiversity Targets and the EU Biodiversity Strategy (with the goal to halt the loss of biodiversity and ecosystem services in the EU by 2020). The Mapping and Assessment of Ecosystems and their Services (MAES) process under the EU Biodiversity Strategy helps determine the state of ecosystems and their services with the intention of integrating natural capital into planning and decision making across Europe. MAES and ROAM are useful tools for strengthening the commitment to restoration. They aid in mapping out sites for immediate action, which supports the implementation of environmental legislation. They also facilitate the integration of natural capital into sectoral policies and move one step closer to stopping biodiversity loss and restoring our landscapes. However, even with these existing support tools, the current entities committed to the Bonn Challenge are all from outside Europe. 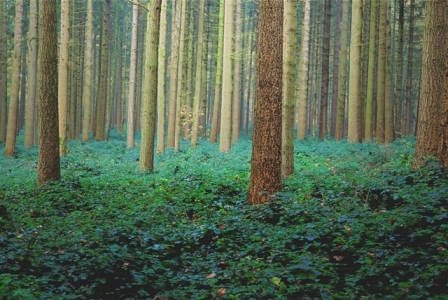 Improving the condition of forests in Europe – which could be recognized globally as Bonn Challenge contributions – should be a priority for European nations. With nearly 2 billion hectares of degraded and deforested lands across the world that can potentially be restored through a wide range of FLR interventions, initiatives such as the Bonn Challenge are key to catalyzing large-scale changes and generating a united commitment to global forest landscape restoration to help secure sustainable livelihoods and ecological integrity for the future.